A final 150km from Beijing to the docks at Tianjin. No dramas on the road but an end of term feel to the ride. A couple of bikes limped the last bit - Deefor's clutch is cooked - so it is good that this is the last day. If tou have anything that has been made in China then there is a good chance it was shipped through Tianjin. It is vast and encapsulates today's China. The area of the port we went to, one of many, was over 10km long and built on reclaimed land. The warehouses stretched back from the waterfront as far as the eye could see. Some blocks were still vacant, others were stacked high with brand new containers waiting to carry goods to the West. 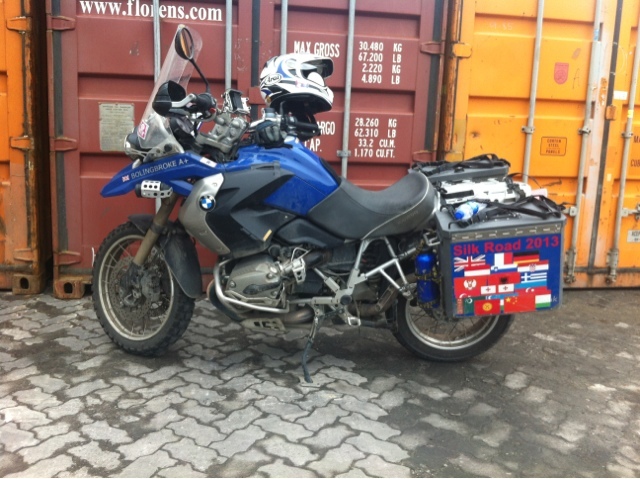 We left the bikes at a warehouse to be loaded into a container and shipped home. The next time we see them will be the end of August. So it is goodbye to the GS for now. It has been a fantastic machine. 20,900kms through sand, mud, gravel and flood. Across oceans, up mountains, along autoroutes, dirt tracks, city streets and peat bogs. All it has needed is a change of oil and air filters, some new tyres and a but of fettling when it was crashed. We travelled back to Beijing on the high speed train. 290km/h in air conditioned comfort from one modern station to another. Why didn't we do the whole trip like this? Great News Enjoy the journey home.